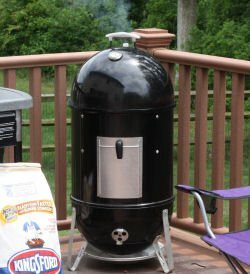 Last week I posted part 1 of my Ugly Drum Smoker (UDS) build. I covered which type of 55 gallon drum you will need and also how to burn it out with a propane torch. In this post I will explain how I made a “no weld” expanded steel charcoal basket. If you think about the inside of a 55 gallon drum you’ll realize that it is just an empty drum. There is obviously nothing inside. In order to have a steady fire source a charcoal basket needs to be made. There are a lot of really clever ideas online and this one I found to be the most logical and simple to build. The idea is to have an elevated charcoal grate which has a coal basket on top of it. The elevation allows for charcoal and wood ash to drop without interfering with air flow. 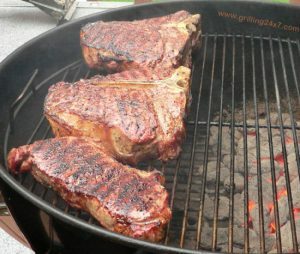 The basket allows you to stack a lot of charcoal for a long 12 + hour smoke. You can see the full UDS Hardware List here. You can see my expanded steel strip laying up against the wall in the back of the above photo. I was lucky in my search for expanded steel. I happen to know an iron fabricator who had the ability to cut me large 45″ long metal strips for only $12.50. However, if you search online you can find local steel suppliers, or metal fabricators. Some people told me to ask for “drops” from other customer’s orders. Apparently these are significantly cheaper. However, every shop I called didn’t have these available. The first step is to take the 45″ x 9″ expanded metal sheet and bend it into a circle. Doesn’t sound too hard, right? Just bend some metal into a circle shape. Well it wasn’t too pleasant. We had the best luck by laying the expanded steel on the ground and placing a propane tank in the middle. We could then bend the edges up and slowly start to form a round shape. This was really hard. It’s easy to get it into a “U” shape but to complete the circle required a lot of pushing, shoving, standing on, jumping on, cursing at, and kicking the metal. When the ends of the expanded steel were finally able to come together a bolt with a large flat washer was put in between the steel apertures. This retained the shape. Once the circular shape is formed and two or three bolts are put through the steel aperture you can secure the bolts with nuts. If you have the ability to weld this is where the steel can be neatly welded into a circle. I, along with most others, do not know how to weld so I had to use the bolt/washer/nut method. Basically a bolt long enough to pass through about 1/4 inch of steel gets a large flat washer. This is passed through the steel openings and another flat washer is put on the inside. Then a nut is put on to secure it, as shown in the photo below. Once the steel basket is in a circular shape the legs are attached to the charcoal grate. Basically the same idea as above is used to secure a 3.5-4 inch bolt to the charcoal grate. Washers flank the grate and lock nuts and standard nuts are used on the outside to keep the nuts in place. This is pretty much identical to how I went about adding a third grate to my WSM smoker a while back. It’s a handy way to attach metal to metal without welding! You can pretty much do this anyway you want. The only real rule is that it should be at least 3 inches off the ground so make sure the bolt is long enough. 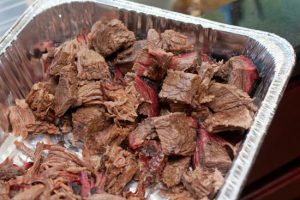 This will not only keep high heat away from the bottom of your ugly drum smoker but it will allow ash to fall and not interfere with air flow. The last step is to attach the circular expanded steel basket to the charcoal grate that now has legs. A couple guys online said they use stainless steel cable ties to secure the basket to the grate. I searched high and low at the big box stores and couldn’t find it. My solution was to use a stainless steel U bolt. The U bolt is a “U” shaped bolt with nuts and a small rectangular piece of steel which goes on each end of the U bolt. This is how the U bolt secures the basket to the grate. You can also slip a lock nut in there to make sure it stays tight. Mine was pretty tight without a lock nut. And there we have it. A no weld charcoal basket. This is pretty darn secure, too. I chose not to add a handle to this because I wasn’t sure the best way. I didn’t want a small weak piece of metal wire b/c I figured it would not handle the heat proximity. I also didn’t want to use a 5 gallon bucket handle because I couldn’t confirm that these handles were not galvanized. Again, I can’t stress it enough: get all stainless steel parts. No galvanized metal. Next post I will discuss how to add the ugly drum smoker hardware, grates, air flow, and paint. Maybe I missed it but how do you clean the inside of the drum from what was contained in it? It was purchased brand new so there wasn’t anything inside it. The burn out removed any lining residue.